August has been a really good month for my makeup and skincare addiction. I’m not sure if that’s a good thing or a bad thing, but in any case, I’ve spent some money this month, and I’ve gotten some pretty good stuff. I had a spectacular e.l.f. haul, which added to some brand new essences and first cleansers, which I can’t wait to test out. I got the Naked Heat palette and discovered my love for red and orange eyeshadows. My Sephora Play box for August (which will be reviewed shortly) had some fabulous items that I loved and had a retail value of over $50. Yay! Another Sephora Play box is here! I feel like I’m finally getting caught up a bit. My June Sephora Play box is the last subscription that I’ve received and fully tried out but hadn’t posted a review for. I’ve been doing a pretty good job of getting through the products included, too, so I’ve even been able to make some progress regarding my stockpile. When you get more than one of these sample boxes every month, it piles up quick! Sephora Play is a monthly subscription that sends deluxe beauty samples and a bonus perfume sample to your door every month for $10 plus sales tax. Shipping is free. The items included can all be found at your local Sephora store and/or online, and the box includes a Play Pass that can be redeemed in stores with any purchase for an additional 50 points toward your Beauty Insider account. As you’d expect, Sephora encourages Play members to visit stores and receive help with any items included in their boxes. There’s even a monthly meetup at select stores. That drive isn’t going to happen anytime soon. It seems like just yesterday I was opening my February Sephora Play box, but that’s probably because I got it so late. Sephora was on the ball in March, though, so I got my box pretty darn quick. This month’s theme was “The Gleam Team” and for the most part featured products aimed at giving you a glow, whether that’s highlighters or (for some) shimmery eyeshadows and lip products. Each month, you’ll get a unique draw string bag that is designed around that theme. It looks like this month takes us back to the white jersey fabric, but then I suppose we couldn’t have satin and mesh forever. February was a good month for me with Sephora Play, though I didn’t get my box until March 1. This wasn’t supposed to happen, mind you. My box had been shipped on February 14, but due to some shipping issues, it never arrived. I’m not sure if this is an ongoing thing with Sephora and whoever is shipping their boxes, but it’s the second time this has happened to me in under six months. Nevertheless, both times it’s happened, Sephora has been great about handling the problem. A few months back, they refunded me the cost of my box, though it did eventually arrive. This month, they simply shipped me a new one. Since one can pretty much expect that something will happen eventually with a product being shipped to them, this is what makes the difference for me when it comes to customer service. To me, this was a good way to handle the issue, and I can at least say that I’ve dealt with their customer service and can give them a good review. Well, it had to happen eventually, I guess. January 2017 was a bit of a dud when it comes to Sephora Play, but that’s just how it goes sometimes with subscription boxes. I’d say that on average, however, I typically get a box I enjoy. This month’s theme was “Beauty, Set, Go” and as it seems to go with Sephora in January, there was definitely a focus on skincare. Normally, that would be a huge plus for me, but there were some major flops here. I’ll get to those in a bit. Each Sephora Play box comes with a Play Pass card. Sephora encourages subscribers to visit their brick and mortars to try things out by offering an extra 50 points to one’s Beauty Insider account with any purchase, and it doesn’t have to be a full size of anything in your box. You can of course save these points up, but if you use the passes, you’re getting an additional 100-point deluxe sample every two months. That’s an extra 600 points per year just by using the Play Pass, and it’s in addition to the 10 points you get each month for the purchase of your subscription! While you’re in the store, you can get help with any of the items included in your box, or try out something completely new. There’s also a monthly meetup, or “Play Date” event in stores where you can participate in tutorials and get freebies, but if you’re not close enough, Sephora Play’s website will offer up video tutorials and extra information on all of your monthly goodies. The bag this month was a changeup from the usual pillowcase-type material. The back is mesh, and the front is made from a water resistant type of material. I like it. I think I looked forward to this more than anything once the reveals went up, and I started to get nervous because quite a few folks ended up getting theirs broken. Thankfully, mine was intact. This is a nicely moisturizing tinted balm, and it comes in two shades, one that’s light and pinky. This is more of a dark berry, and it’s pretty universally flattering. I’m not surprised that I love it. I’ve loved every Clinique lip product I’ve ever tried. This will last me for a little while, and it’s definitely my favorite item in the box. I might be repurchasing this in a full size as soon as I’ve used up my sample. Admittedly, I haven’t tried this yet for obvious reasons– I only add new things once every week or two. This has been added to my testing schedule. I did patch test it on my arm, though, and I was surprised at how moisturizing and hydrating it managed to be for something so lightweight. I’m definitely looking forward to seeing what this does for me. I’m a little careful with hyaluronic acid, because sometimes it can dry out my skin if the air around me is dry, but a good occlusive product and a humidifier is usually all I need to keep things in check. Here’s where the duds begin… I’ve started backing away from physical exfoliants, as I find chemical ones to be far more gentle on my highly sensitive skin. And as this reviewer points out, the tarte FRXXXTION Stick ain’t gentle. At all. I might be able to use this on my arms or feet, but it’s going nowhere near my face. Still… Others have called it a holy grail exfoliator. Here’s where things went really, really wrong for Sephora Play this month, and it wasn’t just me. Sephora made a huge deal of telling subscribers this month to make sure they filled out their profiles and specified their skin tones. Everyone was so excited, because that could only mean that foundation samples were on the way! Now, Sephora Play has done foundation one other time, but they basically just included a sample container for subscribers to take to the store and have filled there. This time, it would be different, and it would go horribly, horribly wrong. None of the foundation samples, including the ones above seemed to be a good match for the people they were sent to. The fairest subscribers received the box I got, with two shades that are way too dark. (There was another sample, too, that also was a bad match for those who received it.) Not to mention, this amounted to pretty much getting a foil packet. The people that these samples would have been a good match for ended up getting boxes with no foundation samples at all. I mean, come on, Sephora… Get it together. Ah, well… I guess every box has to have a miss on occasion. This was just a comical miss. This is officially the first “miss” for me in the fragrance department. I’m not a huge fan of florals, but I’ve enjoyed florals done right. This was a really strong floral– so strong that one spritz was way too much. I literally gagged. This month’s box was valued at around $35 retail, which is about the same as last month. In terms of personal value, I’d probably rank this as breaking even on my $10 for the three items that I do like. It wasn’t a complete miss, but it was pretty bad. Let’s hope that next month is better. If you’d like to subscribe to Sephora Play, you can do that here. Be warned… There is a wait for new subscribers. That said, they seem to open up subscriptions pretty frequently, so my best advice is to bookmark the page and try entering your email address a couple of times per day. You should eventually find a window. Oh my gosh, guys! It’s the last Sephora Play of 2016! This month’s theme was “The Partygoers” and my box had some great items that will be perfect for my New Year’s Eve plans. I’ll be working an all night rave this year, same as last year. Translation: I’m going to be working a solid 14 hours straight. So not only am I going to have to look New Year’s party ready, but my makeup is also going to have to LAST. I’m not talking about lasting through a mere 14 hours. Nope. This is going to have to stand up to a packed building of who-the-hell-knows-what, sweat, and likely a chili dog or two. And yeah… I’ll likely be taking a backup makeup bag, just in case. Posted on December 31, 2016 December 31, 2016 by JennaPosted in Beauty, Subscription BoxesTagged Beauty, Beauty box, Sephora Play, Subscription Box. With all the excitement this month, it’s December already and I’m just getting up my review for November’s Sephora Play. This month’s theme was “Best in Glow” and as the name implies mostly focuses on shine and shimmer and healthy glowing skin. 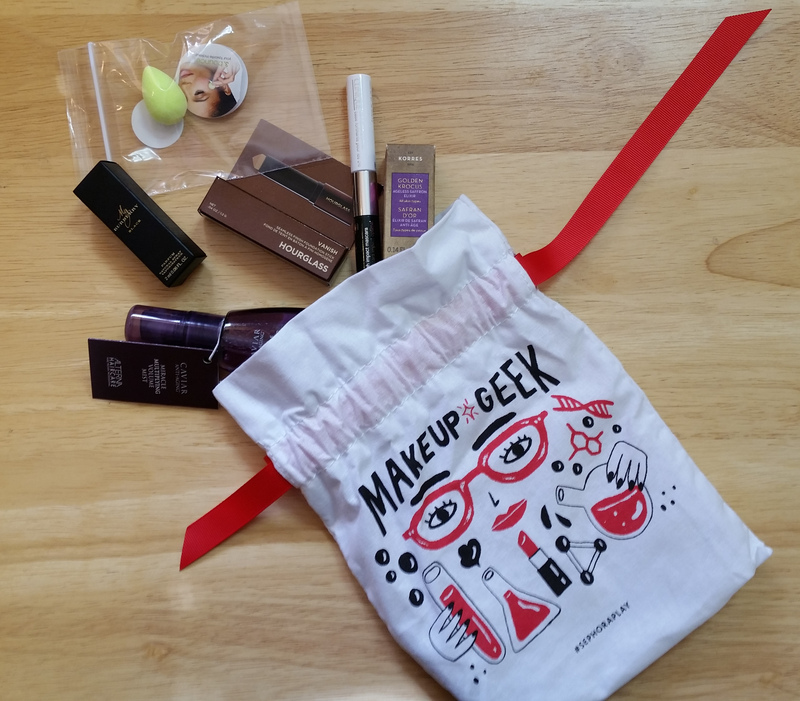 Posted on December 6, 2016 by JennaPosted in Beauty, Subscription BoxesTagged Beauty, Beauty box, Sephora Play, Subscription Box.